As schoolchildren return to classes in the river town of Kearney, Nebraska, their teachers will have new tools to help them grow socially and emotionally. That’s because their teachers attended a professional development day focused on helping children manage trauma, stress, and their own emotions. One of the featured workshops trained the teachers to use WRAP in their classrooms to help achieve these important objectives. The Kearney Hub newspaper highlighted the training event because of the important benefits it will provide for students. For several years, the regional behavioral health authority serving Kearney has been training WRAP Facilitators. These facilitators have worked with veterans’ groups, at inpatient psychiatric units, at consumer conferences, and in other settings. It was natural, then, that when the school system approached the behavioral health authority about planning a day focused on social and emotional health, agency staff suggested including WRAP. Agency staff brought copies of Youth WRAP with them and helped teachers add to their wellness toolboxes. WRAP is appropriate for younger children, too. A WRAP Workbook for Kids walks children ages 7 to 12 through important techniques like identifying when things aren’t going well and employing age-appropriate wellness tools. It’s encouraging that schools are taking social and emotional growth seriously. We have slowly been moving away from an education system built on discipline and rigor toward schools that foster positive development. Are you a WRAP Facilitator? Consider getting involved with your local schools. You can make a positive impact, just like facilitators did in Kearney! 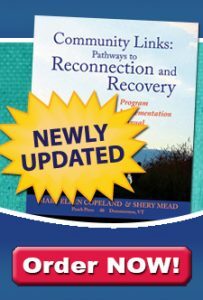 To purchase copies of Youth WRAP or A WRAP Workbook for Kids, please visit wrapandrecoverybooks.com or email us at mjaffe@ahpnet.com.